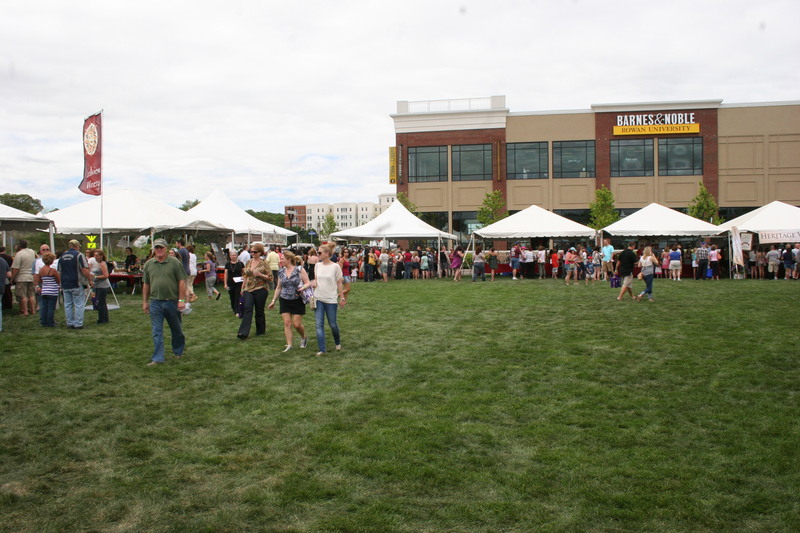 A beautiful sunny afternoon in Mid-May with temps in the 70’s, a nice breeze and plenty of wine and food available was all it took to draw thousands to Rowan Blvd. 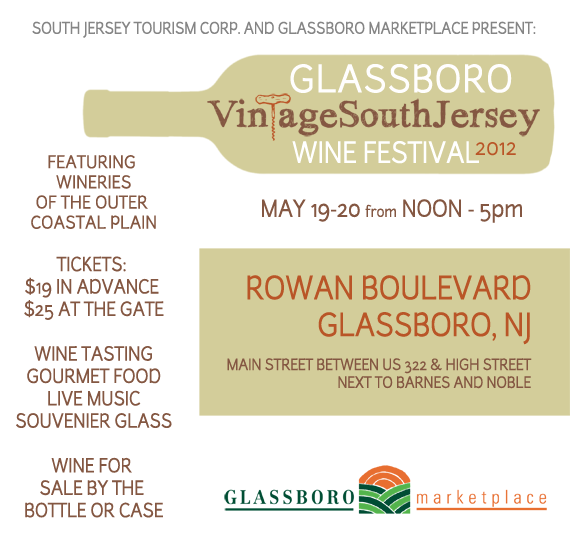 in Glassboro, NJ for the Glassboro Vintage South Jersey Wine Festival. Judging by the smiles and laughter visible throughout the grounds, a good time was had by all. Speaking of judging, the purpose of my visit was to sample many of the red wines offered by the 14 wineries of the Outer Coastal Plain who attended this event. Before I give my opinions of the wines I sampled, I would like to offer a few thoughts on my feelings about New Jersey wines both prior to Sunday and after a day of tasting. I have several friends and family who enjoy New Jersey wines. I have not been among them. Many of those who enjoy them like sweet wines. There is an abundance of sweet wines produced locally. In my opinion, adding blueberries, strawberries, peaches or cranberries, to a wine takes that beverage out of the “wine” category and into something that I call “frine” (fruit + wine). If you like that, more power to you. I prefer the dry red wines done so well in areas like California, Oregon and Washington here in our country and in several others throughout the world. Quite honestly, I had not sampled a great number of dry red wines from South Jersey but the several I have had have not been enjoyable with the notable exception of a Sharrott Winery Cab Franc which was quite good. After an afternoon of sampling wine at the Glassboro South Jersey Wine Festival, I would say I have a slightly higher view of our local wine production. In particular, there appear to be two grapes that our South Jersey vintners appear to be utilizing to create some very drinkable wines. Those grapes are Cabernet Franc and Chambourcin. Cab Franc I have enjoyed for years both on its own and as a grape added as a blend with lots of wines from all over the world. Cab Franc makes up two-thirds of the grapes in the world-class Chateau Cheval Blanc. It’s heartier than Cabernet Sauvignon, less dark and with a spicy pepper component and a touch of violets. Chambourcin is another hearty grape that seems to grow extremely well in this area. Local producers seem to be using it on its own and as a blend with other grapes. It offers up flavors of plums and cherries, pepper and licorice and I must confess, I found it to be consistently, the best varietal regardless of the overall quality of the winery. Chambourcin is not a grape that will be found in California. Its resistance to weather makes it perfect for holding up well in seasons of the East Coast. It was fun to get to know some of our local wines. Most of the folks standing nearby when I sampled seemed to prefer the sweet “frines” and that’s ok. The people manning the booths were friendly, knowledgeable of the product and in many cases, extremely proud of the wines they were producing. In my next article I will review the wines I tasted with scores for each. So, when someone sent me a Craig LaBan (food critic of the Philadelphia Inquirer) article from the newspaper titled “Wines of NJ Draw Fans”, I read it with a large degree of skepticism. The piece featured the Sharrott Winery in Winslow Township, just a few miles from my home. In all honesty, I have never been there and prior to the article, never even knew it existed. It seems that among the wines they produce is a Cabernet Franc that was just awarded a Gold Medal at the recent San Francisco Chronicle Wine Competition. I also learned that it is available at one of my favorite wine stores, Hops n Grapes in Glassboro. I was impressed enough by what I read that I am planning to purchase the Sharrott Cab Franc as soon as this damn snow stops long enough to enable me to visit Hops n Grapes. I will make certain that in the next few days I provide a report on my impressions of what I have for many years felt was an impossibility, a good wine, lovingly nursed to the bottle from the vine, here in the Garden State. Stay Tuned!